Thanks for the video - but how do I get it to play? Great educational clip on how to teach physical boundaries. I have been working with people with autism for about 15 years. 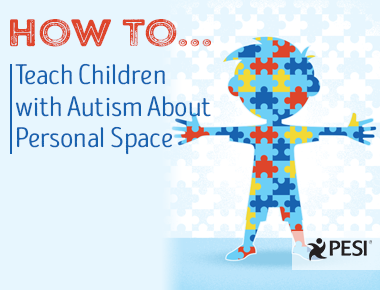 This is the first time that I have heard about this approach to teaching personal space. This makes a lot of sense in terms of allowing the opportunity to experience the feeling of someone in their personal space. I think that this will be a very helpful technique to share with staff who work with folks with autism for whom this is an issue. Thank you for the information. Great demonstration. That is such an effective method. very helpful and concrete message. Excellent points on stimulate input and nervous system space. The activity described was insightful. Thank you for this video. This has helped me to understand why my prior attempts at getting my child to understand personal space wasn't quite working. I will absolutely be trying this. People don't realize how often something simple can make such a big difference. I really believe this will help my child with her friendships and everyday interactions. I really appreciate hearing that this spatial navigation issue needs to be addressed on several levels. I've been working with my son on the concept of personal space since he was five. He is now nine and still doesn't seem to get it. He's had physical therapy and verbal instructions, but I'm eager to try having him experience this with a hoop and a peer.